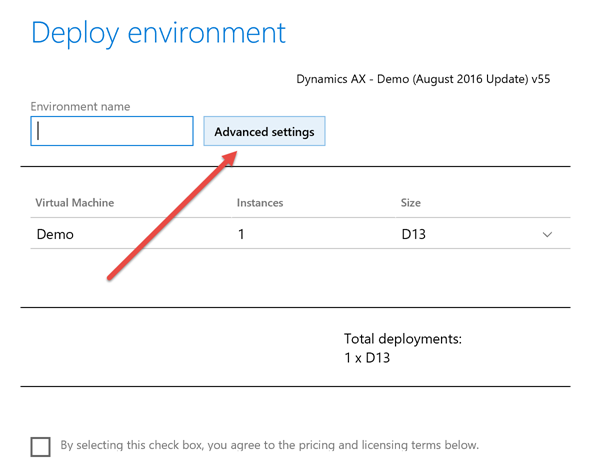 When you want to work with the new Microsoft Dynamics AX, you have some options to deploy the environment. You can choose between deploying an environment on Azure or download a local machine. The purpose of the local machine is mainly a development box, but can also be used for demonstrations (with some limitations). The local environment always contains a predefined demonstration database. 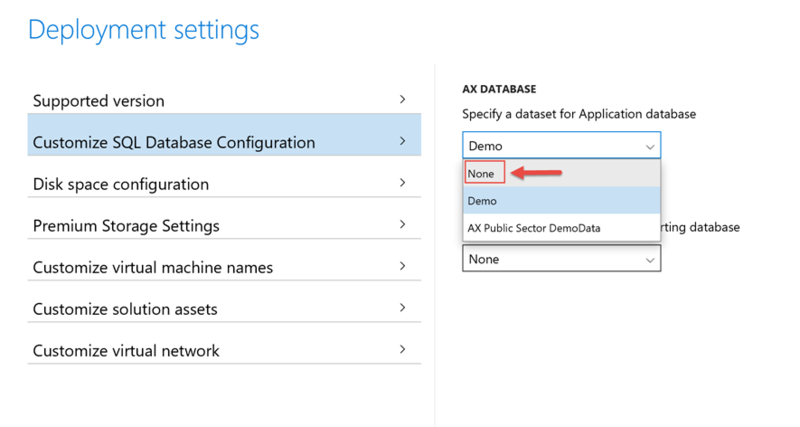 What if you want to start with an empty AX database or test with configurations that will be used by the customer? Continue reading and you will know how to start with another database. Start with an empty AX database? The first question is why would you want to start with an empty AX database? What would be the use? In some scenarios you want to test specific scenarios where the demonstration data could mix up some settings or configurations. In a real life example we wanted to have an additional environment to test data packages before applying it to the Acceptance environment. When you deploy an environment on Azure you have some Advanced settings. Click this button. It gives some additional options. Some of them are required to fill before continuing anyway. When you select the Customize SQL Database Configuration options you can specify a dataset. Set this dataset to None. When the backup was created in the machine on Azure, you can copy this file to a local machine or directly to your local VM with Microsoft Dynamics AX. Then you have to restore the new database in the local machine. Before doing this you have to consider if you want to save a copy of the database containing the demonstration data set as the restore procedure will overwrite the database. If you need help restoring the database, you can find help on this page: How to: Restore a Database Backup (SQL Server Management Studio). Restore the database with the options Overwrite the existing database and Close existing connections enabled. To restart the IIS service, you can either open Internet Information Server and or go to the Windows Services and restart the World Wide Web Publishing Service. 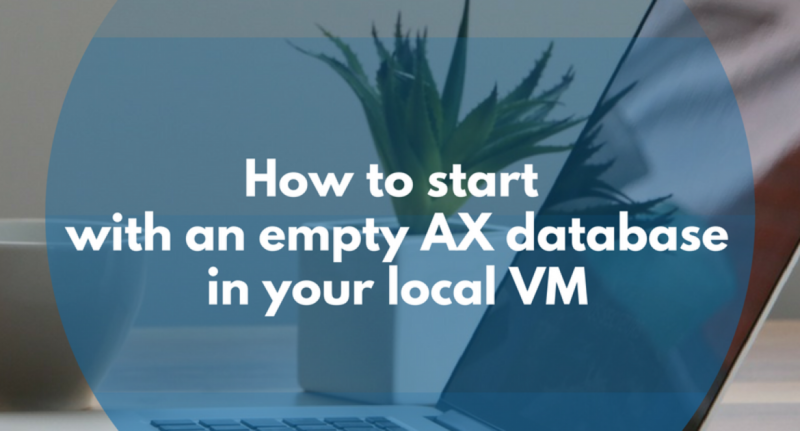 To synchronize the AX database you need to open Visual Studio in your local AX machine. Make sure you run it in Administrator elevated mode (Run as administrator). 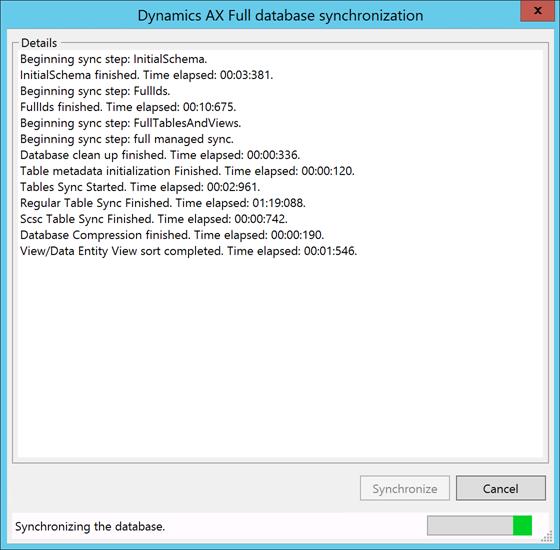 Then open the Dynamics AX menu and choose the Synchronize database… option. When this process has been completed, you can open the web browser in your virtual machine and open the Dynamics AX URL. You can login with the same credentials which has been initialized when you deployed the environment without demo data. You can use data packages from LCS or own created packages to load specific test data. Eventually you can create a backup from a customer dev/test database and use it in your machine. Using this method is not guaranteeing that all related processes are really working correctly. This blog is as example not describing how to deal with management reporter data.